Shuck-Britson accepted an ACEC Honor Award for Engineering Excellence on the CRST Center in the Buildings & Systems Category on May 10, 2017. 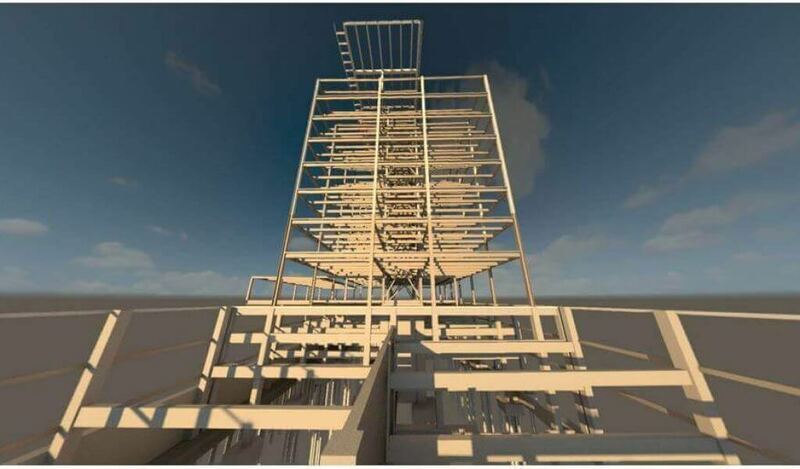 The Shuck-Britson structural team utilized Revit software for Building Information Modeling (BIM) to create intelligent models that helped guide the project. 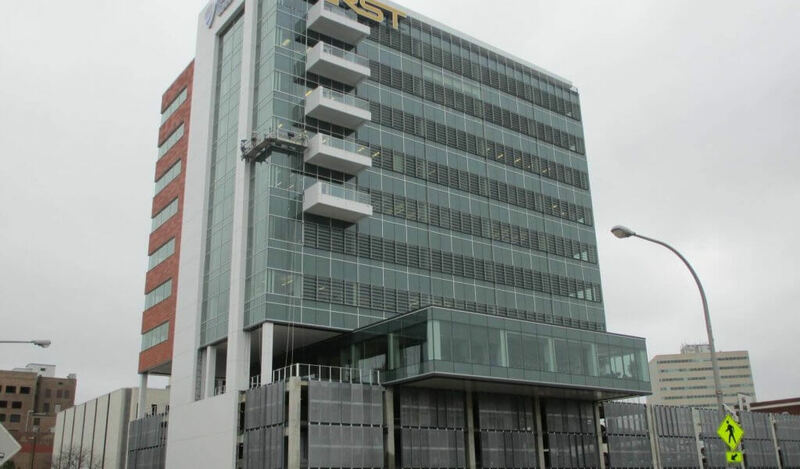 Located on the east bank of the Cedar River in downtown Cedar Rapids, Iowa, the new $37 million CRST office building is a 12-story structure with three levels of parking ramps, eight levels of Class A office space, and a one level mechanical penthouse. 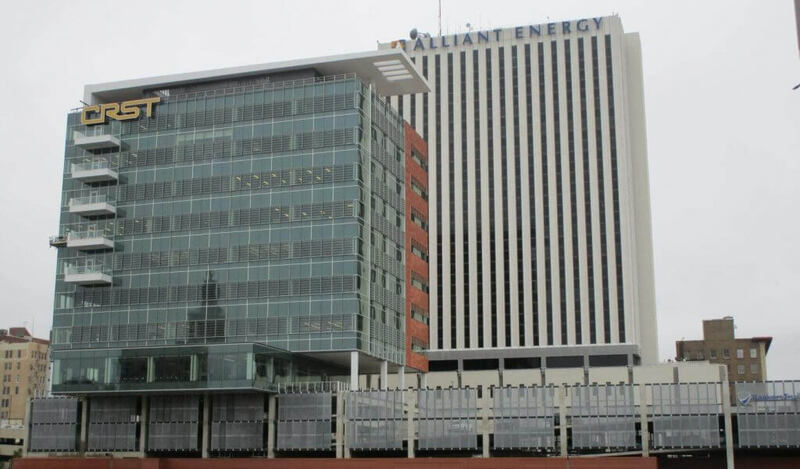 As the first major development along the Cedar River following a devastating flood in June 2008, the CRST building provides a welcome and dramatic change to the Cedar Rapids skyline. Built on the site of the former First Street Parkade which was severely damaged by the flood, the new structure is designed to withstand future flood events and provides breathtaking views of the river and surrounding urban landscape. Due to the complexity of the project, a collaborative and comprehensive project approach and design were key to its success. The building is in an area that has a significant history of flooding, so a new 12-foot tall flood wall certified by the U.S. Army Corps of Engineers was constructed. The flood wall, which runs the entire length of the 200 block of First Street SE, is an essential element of the Cedar River Flood Control System currently being developed. In addition, a new pump station and gate well were integrated as part of the project; both of which are significant pieces of the city’s new infrastructure system. The reused urban site presented typical and non-typical congested downtown challenges. Existing foundations were present. Adjacent existing infrastructure (buildings, streets, utilities, river wall, bridges) was required to be protected in place. New adjacent and integral infrastructure (floodwall, pump station, gatewell, riverwalk) required special provisions throughout construction and the life of the structure. Reinforced concrete, post-tensioned concrete, structural steel, and driven steel pile support the anatomy of the tower, parking garage, and flood control system. Current governing codes and design guides were utilized to evaluate the site, structural system, and other building systems. Proven and emerging engineering techniques were used to analyze and test the building design. Numerous planning, design, and construction entities collaborated to execute the project successfully. Completed in Fall 2016, the CRST Center offers 113,000 square feet of office space enclosed with glass curtain walls and terracotta panels. 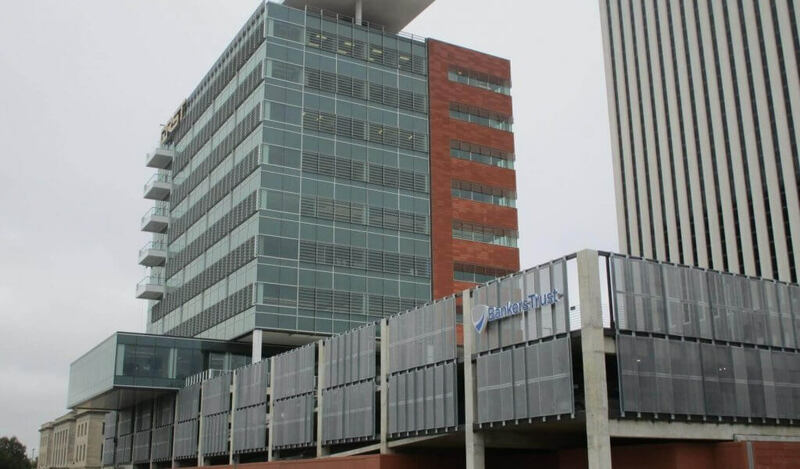 The glass allows in natural light, while the terracotta panels work to incorporate the building with the historic brick facades downtown Cedar Rapids. A total of 228 cars can be accommodated within the three-level parking structure. As the structural engineering consultant, Shuck-Britson, a division of Snyder & Associates, was responsible for the design of the main structural support elements including foundations, columns, structural floors, roof enclosures, lateral load resisting components, flood wall, pump station, and gate well. Services provided by Shuck-Britson included schematic design, design development, construction documents, and construction administration. Value engineering was critical to the project to accommodate a tight project budget and schedule constraints. Project execution was a fast track process. Integrated Project Delivery (IPD) and Building Information Model (BIM) were utilized to expedite the building’s construction. 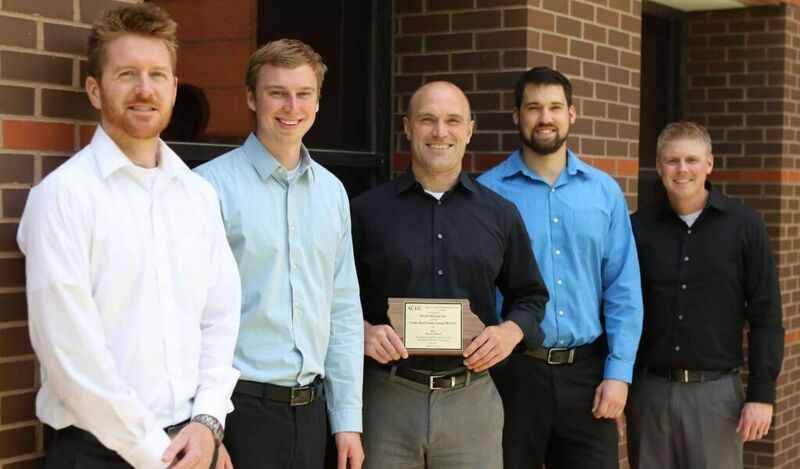 On Wednesday, May 10, 2017, Craig German, Lead Structural Engineer for Shuck-Britson, accepted an ACEC Honor Award for Engineering Excellence on the CRST Center in the Buildings & Systems Category.